I have seen numerous flashing light badges at trade shows and conventions. They are often handed out as gifts to promote some business. The devices often use inefficient circuits, which cause the battery power source to be quickly depleted. My circuit is simple but efficient enough to provide months of continuous LED flashing. It also has a tiny push-button switch to turn on and off the light flashing, extending battery power. 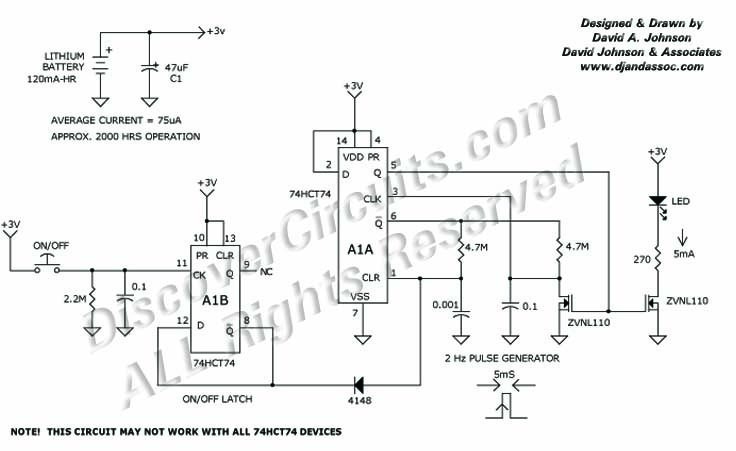 Not all 74HCT74 devices will work in this circuit. I suggest using a quality device from Texas Instruments.